The group claims this initiative will “reform” California’s fractured death penalty and “speed up” executions in our state where currently 748 men and women wait to die. On the other side of the issue is “Justice That Works,” lead by Mike Farrell, the actor who starred in MASH, a longstanding death penalty abolitionist and internationally renowned human rights activist. Joining Mr. Farrell are an impressive array of politicians from across the political spectrum, religious leaders, attorneys, writers, artists—and just like the Californians for Death Penalty Savings and Reform group— influential law enforcement leaders and the family members of murder victims. They too secured enough signatures to qualify proposed new legislation, Proposition 62, “The Justice That Works Act of 2016,” for the Nov. 8 ballot. Proposition 62, they say, would: (1) replace the death penalty with life in prison without the possibility of parole; (2) require death row inmates to work and pay wages to their victims’ families; and (3) save California taxpayers a projected 150 million dollars a year. 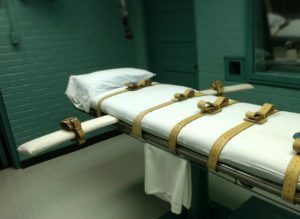 With these basics in mind about the grave and complicated choice Californians are soon to make—a decision that will greatly influence the continued existence of the death penalty in America—I respectfully submit that, despite its fanfare, Proposition 66 is no “Eureka!” moment for Californians. Instead, unlike carpenter James Wilson Marshall’s historic discovery of gold at the base of the Sierra Nevada Mountains in 1848, Proposition 66’s proposed turbo-charging of California’s “machinery of death” is, underneath its sheen, twenty-four carat fool’s gold. Out of the gate it needs saying that this “speedy death penalty” initiative, if it were to become law, would do absolutely nothing to reduce the current massive backlog of condemned state prisoners to whom it could not retroactively be applied without a long, bruising, legally dubious and extremely expensive fight. Perhaps of equal or greater importance, voters need to remember that, when we talk about a “backlog” of death row inmates, we are not talking about curtailing an exploding population of coyotes. We are talking about a population of human beings, many of whom suffer from serious mental illness, a frequent byproduct of a childhood where poverty, abuse, violence, and neglect were the norm. Moreover, it bears noting that in order to clear this “backlog” of 748 souls, California would have to execute a person a day—every day, including Saturdays, Sundays, and holidays—for more than two years. If ushered into law, Proposition 66, intended to rev up California’s “machinery of death” to similar macabre-type output, would do anything but. Not only would it deprive Californians of their rightful seat at the table of civilized, just and peaceful people around the world—whose countries long ago rejected capital punishment—it would result in a flurry of even more death penalty appeals (sucking money from voters’ wallets and exhausted state coffers at a faster clip than wildfire burns). 1. The proposed law would “require attorneys who are qualified for appointment to the most serious non-capital appeals and who meet the qualifications for capital appeals to accept appointment in capital cases as a condition for remaining on the court’s appointment list”; this provision will open a floodgate of new ineffective assistance of counsel cases due to an increased number of incompetent, unqualified, and/or improperly trained lawyers taking death penalty cases—some motivated solely by financial need. Forcing lawyers to take cases they otherwise would not is death penalty proponents’ wrongheaded way of addressing the fact that there are not enough willing and qualified lawyers in California to take these kinds of cases—the most difficult, emotional, time-intensive, resource-draining cases our legal system has. Clearly the logical answer is not the forced conscription of lawyers in these, the most serious of cases. The insertion of this vindictive-minded provision, which does nothing but hurt the quality of California justice, underscores why the bill as a whole is not reform-centric and should be defeated. To sum up, the choice voters have to make in November—one that goes to the core of who we are as Californians—Proposition 66, the “Death Penalty Reform and Savings Act of 2016,” is a wolf in sheep’s clothing; it would yield no savings, and it does not reform. Stephen A. Cooper worked as a D.C. public defender between 2003 and 2012 and as an assistant federal public defender in Alabama between 2012 and 2015. He has contributed to numerous magazines and newspapers in the United States and overseas. He writes full-time and lives in Woodland Hills, California. “Perhaps of equal or greater importance, voters need to remember that, when we talk about a “backlog” of death row inmates, we are not talking about curtailing an exploding population of coyotes”. Exactly! Coyotes are innocent animals doing what nature intended them to do. Unlike the torturous, murderous, scum on death row. I refer those of you so quick to act of Exodus 20:13. This is a moral and ethical issue, not a political one! Those people have been judged lawfully under our legal system receiving life in prison with no parole is a far worse punishment than bringing the rest of us down to their level of depravity. Yikes! Uh, if you’re going to reference the Old Testament in Exodus 20:13 as having validity to your notion as not to kill others, then within the same Old Testament, you acknowledge that all gays should be killed! In simple terms, you can’t have your cake and eat it too. Get it? Justice delayed is justice denied. Speed up the process ans quit making the victims famiies and loved ones suffer cruel and unusual punishment. Oh I forgot to mention, after Richard Benson finished molesting the girls he beat them to death with a hammer and then burned down their house to cover up the murder.. ehy is this monster still alive? Do a Google search for Laura Camargo in Nipomo and read about Richard Allen Benson, who was convicted of murdering Laura and her young son Sterling, age 23 months, so that he could spend two days molesting Laura’s two daughters, Shawna,age 3 and Stephanie, age 4. Richard Benson was sentenced to die and was supposed to be executed in 1993, but thanks to anti-death penalty advocates he is still sitting in San Quentin.. Does anybody think something is wrong with this picture? California has a population of 37 million and currently has 743 death row inmates, which is low considering the state’s overall population. These 743 got to death row the old fashioned way: they earned it! Oh and to the bleeding hearts out their who think these men don’t deserve to die, do a little google research and read up on their crimes. If you still think they deserve to live then you should do a little self evaluation, because you will most definitely be in the minority..
Mr. Cooper, what would you tell the families of the 5 police officers who were just executed in Dallas? Stephen, thank you for convincing me to vote FOR Prop 66.